What if high school had options? I learn that North Star is a high school alternative, a community-center-like place where teens can take any number of classes and study whatever they desire. Ken reports that most of his students go on to colleges or jobs, and that all come back to tell him how life-affirming North Star was for them; that the freedom they experienced allowed them to grow and develop as excited learners. This conversation is making my head spin with delight. I’m sitting there remembering how bored I was in high school; so bored that I created internships for myself and got my guidance counselors to sign off on them so I could study what I chose and leave that suffocating, institutional building. What if there had been a North Star for me? We discuss how there would be no change in administration, infrastructure, or funding. High schools could continue doing what they always do, while including a second offering for more self-directed learners. My mind is officially blown. If I had had this experience I would have immersed myself in subjects; I would have taken only art and language courses one semester, only science and math another, literature, writing, and English in the spring. We all learn differently; I would have benefited from choosing my own high school schedule. No one ever told me that the GED exam is equivalent to a high school diploma. I didn’t have a Ken Danford in my life. We all know how public school developed in the US when the government decided that child labor was unlawful, yet adults worked full-time, and so what to do with the kids? We also all know how quickly education became standardized as the schools grew in size and needed efficient ways to keep records. The goal of public school was to keep kids safe and accounted for (while parents worked) and to train kids for factory work. In our current day and age, more and more jobs have become automated, and our schools are preparing students for jobs that don’t exist; the mundane, follow-the-rules cookie cutter jobs are a thing of the past. Now we need citizens who think critically and creatively and want to solve problems that benefit society. That is not a realistic outcome if we force children for 13 years (from ages 5-18) to sit and follow directions all day. What if teens had more options? What if you could do the typical, proscribed course schedule and graduate with a high school diploma, OR you could take whatever courses you wanted and take the GED in place of the diploma? And what if there were more non-high-school alternatives, like North Star, for teens who learn differently? As teachers are getting ready for another school year to begin, I wrote the following article for Edutopia: Co-Constructing Your Classroom: The Space & The Community. After reading countless articles, studies, and whitepapers on why homework is counterproductive, creativity is being squashed by the soldier-like regimen of public school, and why people forget more than half of what they learned in school, I’m prepared to offer a new kind of public school. These micro-schools in Brooklyn are doing it right. The schools are structured around community and communication, not content. In many of these schools the teachers are called facilitators and are trained in helping students develop strong communication skills, independence, and self-regulation skills. Instead of corporations and non-educators deciding what students should learn and when they should learn, and master it, students choose topics of interest to dive into. Students are taught to set intentions, reflect on their actions, and hold themselves accountable, while also learning to be flexible. The current public school system could be transformed into this by using the same infrastructure and materials, changing the curriculum from an absolute to a supplemental tool, and making professional development for teachers center around communication skills, problem solving, and nurturing students instead of mastering benchmarks. A new kind of public education can be fostered, without much additional costs. The focus is on students discovering their own learning style and then running with it. - Outdoor exploration- neighborhoods, parks, fresh air, sun, rain, and snow! There would be opportunities for internship, apprenticeship, field trips and travel, and guest speakers, experts, presentations, and workshops- decided by the students and always optional to attend. What kind of adult would you be if this was your school experience? Should I do a Gap Year, Study Abroad, or Volunteer? Malia Obama may be the spark I’ve been looking for. Throughout my life I’ve advocated for traveling, exploring, and immersing yourself in other cultures. - In high school I went on sponsored trips around the world to understand other cultures. - In college I studied abroad in a tiny city in Italy where I spoke Italian, made friends with international students and locals, and began to see the similarities between humans. - After college I backpacked through Eastern Europe, wanting to walk where my great-grandparents walked. Throughout my adult life I’ve traveled, often staying in small communities with friends or locals to get a feel for life there. I’m not as interested in visiting landmarks as I am with connecting with the people who live somewhere. From 2014-2015 I lived in a small village in southeastern India as part of an environmental impact organization and sustainable community. I became immersed in local culture and became an expert in reforestation and water conservation in arid lands. I’ve recently discovered bicycle touring, a way to really see, in slow-moving fashion, an entire country or island, zigzagging or riding the perimeter, meeting locals, camping on stranger’s front yards, connecting with friends of friends of friends. - The world is smaller than you think. It’s not a scary or dangerous place. And we are all connected. It’s easy to make friends and find people you really want to share with and get to know, everywhere. - The different choices we make as humans are what brings us together and helps us learn from one another. It’s empowering to use these experiences in other times of your life - to remember how someone else solved a problem or overcame an obstacle. These are lessons we can use over and over again. I wish for young people to get out there and become a part of the larger humanity. There are so many ways! o Rhianna even has a scholarship for students in Central and South America to study abroad in the US! In case you are wondering about cost, diversity, college acceptance or graduation, here is a great article with resources Busting the Top 10 Study Abroad Myths. I’m excited to see what Malia does with her Gap Year. It could be the spark of a movement towards global exploration and cultural understanding that we so desperately need. What if students were connected to working experts in the field of what they are learning? How many times do you hear students say, “when am I ever going to need this?" When I was teaching I tried to bring experts into the classroom to talk about their work in light of the content or skills I was teaching. But it’s hard! All of that scheduling and making sure the experts know how to talk to children. Oy. I dreamed of a world where I could contact experts at my fingertips and video-chat with them in my classroom for 20-30 minutes of sharing about their work, making what I was teaching relevant to my students, and broadening my students’ ideas of the jobs and careers that are out there. Last week I attended the NYC Education Forum where 11 startups in the education-technology sector presented their projects for a chance to win $10K. Nepris, the winner, recognizes this need and has done something about it! Teachers go on Nepris and look for experts who use what they are teaching in class and then schedule a time for them to video-chat with your class. The brilliance of Nepris is that it leverages the LinkedIn community to find industry experts, vet them, and connect them with students. What if for everything you learned in school there was an expert who uses that content waiting to video-chat with you? For 10 years I taught in schools like this where while creativity and independent thinking were fostered (despite a scripted, overly structured curriculum), a culture of “no” always loomed. In the 2013-2014 school year I was graded on how well I could predict, in October, each student’s reading level, in May. I had just met these 4 and 5 year-olds and my perceived teacher-effectiveness depended on my educated guesses of children for whom I had not discovered their learning styles and abilities and who came to me with no “prior history”, as is the case in older grades where teachers are given evidence of student learning from their students’ previous teachers. That was my last year of teaching. I took a yearlong sabbatical in India in an environmentally-sustainable community that practices unschooling. I chose this community, as it was a place where children mattered; their interests were encouraged and they were trusted to be active members of the community. It was assumed that they implicitly wanted to learn. Over the course of the year I spent much time with these international children of hippie-minded parents who had an inkling of their privilege in that they had previously attended school or had cousins in traditional schools in other countries. They took full advantage of having freedom to learn anything from anyone. They were used to asking adults to explain what they were doing, to offer feedback, or ask for feedback. The village children also became a central part of my life in India. They came from poor families and attended government schools, which continue to use corporal punishment despite its illegality. These children were also witnessing Indians they personally knew, in their 20s, going away to school, leaving the village, and exploring jobs and opportunities away from home not having to feel guilty for abandoning their village. The middle class is growing and the children are preparing for their upcoming freedoms. My experience of these young Indian children was their innocence and eagerness to soak in whatever they could. Like their international counterparts living in my community, these children recognized the value of meeting people from other countries, learning other languages, sharing their ideas, teaching each other their skills, working on projects that matter to their lives in collaboration for a better foreseeable world. The more time I spent away from the American public school system, the more I could envision what I think school could be like. Gone are the necessities for creating factory workers. We are in a new position with different needs. Unfortunately the first need is a place for children to spend their day now that all of their parent/s are working and no one is at home to pass on skills and traditions and experiences. Children just need a safe place to be while their parent/s are at work. Some see it as glorified babysitting. Second to logistics is the revelation that the world’s factories are automated, and the workers we are currently training will increasingly have creative and service jobs - jobs that depend on a human component. This means our children should be in a school that leads them to do this best, just as current schools and those of our past prepared them for factory work. The children need to practice what it means to be human- to think, make choices, reflect, speak, share, listen, and work together. What does this look like, you ask? When we think about how adults perform these creative and service-type roles we hear more and more talk of uninterrupted hours of time to create, make, ponder, test, and, in essence, play. This could be school: a few hours of time each day when children can study what they choose and make what interests them. This is how we develop learners, creators, and inventors. This is how we allow them to be human. We are also in a time and place where we can remember our ancestors working physically all day - in the fields, at home, and as artisans. Before massive industrialization we were outside for most of the day and had closer relationships to nature. This could be school: a few hours of time each day when children can explore nature including parks, neighborhoods, and playgrounds, in all kinds of weather. This too, is how we allow them to be human. Even the so-called best public schools are instilling anxiety and fear in their students - to perform, complete work by deadlines, reach certain benchmarks within short time periods, and compare themselves to their peers. Why are we doing this? What kind of children do we want to develop into the adults of tomorrow? What kind of world do we envision 10 years from now? 20 years from now? Now back in the US I am consulting with educational organizations who I believe are pushing these boundaries and asking the right questions. In order to stay connected to the public education sector I am substitute teaching in one of these “best” public schools. My experience there, after being out of this type of environment for so long is startling. The classrooms and hallways are seriously over-stimulating. There is too much on the walls. Too much that did not develop from the children but rather was asked of them. The children’s work all looks the same. What purpose does this achieve? The schedule and structure of the day includes changing activities every 15-20 minutes ensuring that there is no deep engagement. The children are “taught” the same things, expecting the same output. There is no acceptable diversion from tasks, no bursts of creativity. There were a few times when the class seemed at peace- playing outside and playing in the classroom – self-chosen activities. The children were absorbed, focused, quiet, talking to each other with purpose, listening with interest, and figuring things out. They were learning. They were being human. At the end of the school day, knowing I had accomplished the plans the teacher had left for me, I took 15 minutes to tell the class about my experience in India, answer their questions, and show them a short photo-presentation of where I lived, the insects and animals I encountered, and what daily life was like. I showed short videos from the early activities of a fishing village, and a local musical performance. They were enthralled. Their interest was sparked. For a moment, they were the kind of kids I hope will be the adults of tomorrow. I think a lot about setting intentions. The language we use should reflect our intentions. Often language is chosen for it’s simplicity, or ability to be broad, but isn’t it more important to use words that elicit the kinds of interactions we seek to have? Along these lines I’m interested in the changes, if any, that would occur if every “comment” box was changed to “reflect.” Would you be more willing or less willing to share your ideas? Would you frame your opinions more gently, as a reflection is personal and makes one vulnerable? Would there be less arguing because the venue doesn’t allow for it, and more discussion and validation of ideas? Would people share more or less subjectively? More or less objectively? Would we see more productive conservations and less ranting? Would we, over time, engage with the Internet differently? Would we see these dialogue boxes as a place for constructive conversation? Would we use these forums to help us understand ourselves better in the context of humanity, of the world? What if students designed their own schools? The program Sam designed, The Independent Project, debuted in 2010 and is still going today. Students applied, proving that they could manage their time well. The majority of the semester is structured into half-days. For half of each day, per week, students choose a question to investigate and then share with the group at the end of the week. The other half of the day is filled with a semester long individual project that could be learning a musical instrument, writing a book, etc. The last 3 weeks of the semester the students work collaboratively to create a project for social impact. The only requirements of the various projects are “effort, learning and mastery.” There are no grades; it is pass/fail. This student-guided experiential education is the key! Parents of students at Sam’s school were concerned about not having letter grades for the project, but colleges were excited to read about students who did something different. Not only that, the project helped students develop skills: they were more proactive, self-motivated, good with managing time, focused, collaborative, communicative, curious, and engaged. For me, one of the unexpected positive outcomes of this project is that it has shown the teachers what the students are capable of, and has encouraged teachers (of regular school subjects) to give ALL of their students more choice- what to read, which topic to study, how to present. And through this process the teachers are also discussing their own roles in student education. Holy reflection, Batman! The teachers are trusting the students to make decisions about their own learning! “Students who have gone through the program ask more questions and have a greater awareness of how to answer them; construct their questions more carefully; became more thoughtful in the way they consider ideas and evaluate sources; and became better at managing their time.” Win. The couple in their 60s whose kids have grown and left and encouraged them to host cyclists, as we are “kinder travelers” than the CouchSurfing crowd. Upon entering I was given a room, a towel for a warm shower, and told dinner would be ready in 30 minutes. The gentleman of the couple didn’t tell us until after dinner that he’s a retired 5-star Michelin chef. He made salad with fresh raspberry vinaigrette, and gluten free pasta with fresh veggies and a homemade tomato sauce. He apologized for whipping it up and not making a ‘real’ sauce. Ha! After dinner we looked through a stack of about 10 travel photo albums as without language (he only spoke French) we could communicate through image. The girlfriend of a bicycle-enthusiast (who was away at the time) who knew nothing of bicycles but was super happy to talk with us, cook for us, and send her neighbors to check up on us while she was away. The couple in their 20s who met while on separate cycle tours through Romania. They lived in the attic of a converted brewery with amazing archway doors and ceiling cross-beams. The lady-cyclist made her own jam and sent us with cake for the road. The couple in their 30s, living in a small city, who just came back from a 2.5 year cycle tour, were featured in their local newspaper, had very few belongings, paid $3/month to rent their apartment (because it could be sold at any moment and they’ll have to leave so that’s the deal. What a deal!) They just bought a house in the country, gutted it, and are rebuilding it to suit their needs, and bicycles. They get requests from Warm Showers everyday. They want to repay the community for the countless WS hosts they visited on their big trip and so they almost always have guests. The retired racing cyclist with a house at the end of a road and a horse shed converted into a loft with extra beds and an external-facing kitchen. She had terraces of pineapples growing, a hot tub, some animals, and a kitchen she never used. She watched me make dinner for us with enthusiasm and constantly commenting on how impressed she was that I could just “whip up” a veggie-noodle stir-fry with many of her own ingredients! I’m humbled to be shown so much love from these people with whom I share a passion, a lifestyle, a sense of adventure, and a desire to learn from and about other cultures. They open their homes, give me the keys, tell me to eat anything, and are sometimes amazed at just how much I can eat! They understand my journey. They know what my needs are. We speak the same language. And the one thing we all agree on is that when cycling and staying with people, in their homes, you get to see a different side of the places you visit; you get to see the locals, the community, the traditions and customs. You get to really see how they live. And in all cases, you are humbled. It’s amazing to connect and feel so connected because of this simple thread that weaves us. What if there were communities like this for all different hobbies and you could stay with people based solely on shared interests? Like CouchSurfing with a bit of Pinterest thrown in… Just thinking out loud here but there could be ways to connect with people traveling to a concert with people from that city who are also going. Or when there are conventions you could stay with people who have that interest in the host city: knitters, artists, scientists, foodies… it’s endless. This could be the future: not networking, but finding your network. I had said I didn’t want to return to New York. I had been overwhelmed by the feeling of being unable to escape consumerism at every turn. I wanted to live in the world of Gift Economy - trusting in humanity to provide for me and offering my services freely for the greater good. I left India, where I had happily lived in a Gift Economy-bubble for more than a year. I had a backpack’s worth of possessions and people to share them with, not needing anything else. My service to the community was met with a hut to live in and three vegan meals a day. The community I was living in had broadened my view of and affirmed my belief that we need very little to survive and can live without doing further damage to the earth. The community also humbled me with regard to the juxtaposition of how large the world is and yet how small it can feel. I met like-minded people from all over the world who, on most occasions, felt instantly like family. I am just one of many but I am connected to all. It is a powerful feeling to abandon fear and live as though the world is my backyard. After doing my first bicycle tour I rediscovered my body, my physical strength, my desire for sweat-inducing adventure. And so I set out to cycle solo through Europe on my second bicycle tour. Cycling, I realized, forced me to be dependent on myself but also to admit that the world around me would support me. In this experiment of sorts I survived on, at most, 10 Euro per day. There were many days when I spent nothing. I slept in the homes of kind strangers who fed me and sent me with extra food for my journey. I rode all morning and afternoon, feeling thankful for my connections to humanity and also thankful to feel fearless, knowing that I’d connect with the earth, with my body, and with other kind strangers along the way who would help me fulfill my needs. At farmer’s markets across the lands I was asked about my story, encouraged to keep going, not to lose my sense of trust in humanity or my bravery to travel alone, and I was rewarded for inspiring others with extra stuffed grape leaves, oranges to keep illness away, and an extra shot of espresso to keep moving and not feel the cold. I lived on the road for almost 10 weeks in a society much older than my own, feeling the weight of age in the physicality of roads, villages, churches, and farms, trying to understand the history that came before me, the people who’ve passed on these same roads for different reasons, and the current economy of Western Europe, a rich entity not unlike the U.S., my home. I found it easy to live peacefully with nature and people and feel like my one-on-one human interactions were my added-value to open up minds and explore feelings of those who felt stuck, or unable to make change, or like they didn’t have choice. I was always supremely aware of my privileges: having saved some money over the years so I could make experiments like this, not being in debt, having people to support me if I fail, not having any dependents… freedom in so many ways. I said I wouldn’t return to NY. I marveled at how well I felt mentally, physically, and emotionally being outside all day on my bicycle, feeling my body work to cover ground, breathing in fresh air, hours of quiet time, the sound of a rushing river, being among animals, and learning the stories of others as I shared my own. In this time I found a partner, from NY, who encouraged me to spend the holidays with him and to rediscover NY, give it another chance, see how jaded I really was, and find out if it was still my home. My past life in NY was fast. I rushed from place to place, always needing more time in the day, never feeling finished, my to-do list always growing. I spent little money but nonetheless I paid for things that never occurred to me were optional. I ate on the subway, I crashed hard at night, I never felt like I had time for me, even though my work as an educator was enjoyable and enriching- it was everything but also felt like a sinking hole I’d never get out of. After my time living in India, enveloped by nature, barefoot more often than not, living outside among trees and creatures, sheltered from consumerism, celebrating on a daily basis the contributions we can make to the earth through our life choices, and then cycling through rich lands where I chose to live simply and share my experiences, I have become calm. I am less reactive, more patient, waiting to take in all that is around me- the environment, the conversation, the big picture. I am not in a hurry. I am not impatient. I am not worried. Friends say I am more grounded. And so I have rediscovered NY. I am not waiting, impersonally at crosswalks with other people in a rush; I am chatting with cyclists waiting for the light to change, secretly sharing joy in experiencing the city this other way. I am not in a high-rise apartment building, disassociated from people, feeling the city hum below me; I am living on the edges, with friends, in ethnically-diverse communities, artist-rich communities, feeling “neighborhood” more and more. I am not racing to teach my heart out until I collapse at the end of the day; I am reading and writing and meeting with other education reformists who see opportunities for change and are working with me, waiting for the right moment, to pounce. I am different, but so is my relationship with NY. I remember being told many times by many people that you are who you are no matter where you are, that changing your environment will only change you temporarily; you are already formed. I disagree so much with these sentiments; your experiences form you throughout your life and they are dependent on where they happen, who they happen with, and how you reflect on them, incorporating the changes you like into the habits of who you are. And so, once again in my life, NY is home, even though I’m inside buildings, wearing shoes, and averting my gaze from the barrage of advertising that is capitalism. I am grateful for my privilege, my choice, my adventures and experiences, the people I’ve crossed paths with and those I hold close, the times I cycled alone for hours being one with this planet, and feeling bold in the face of a plagued public education system while my brain fills with solutions for our children. 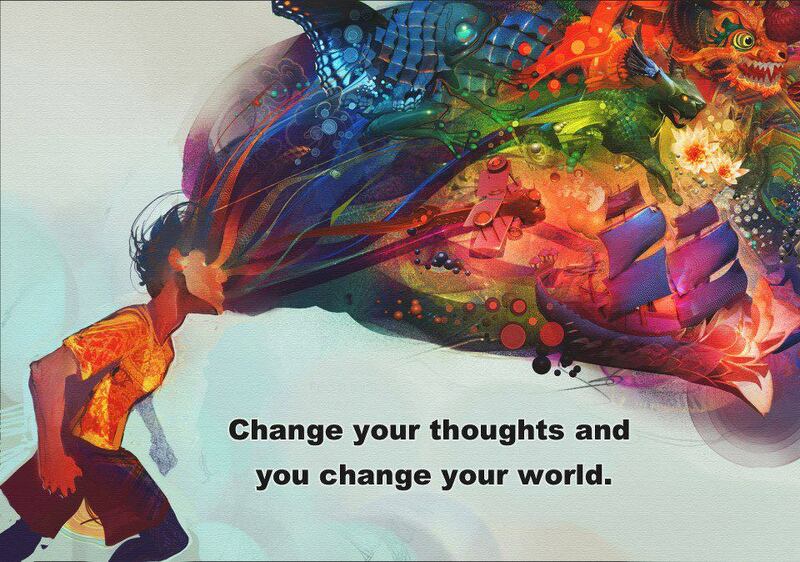 “Change your thoughts and you change your world.” Norman Vincent Peele said this. He was the godfather, of sorts, of the power of positive thinking.